Nirvana Development Academy is focused on enjoyment and development of young players, open to all children aged 5 - 10 years old. The sessions are aged-grouped with ages 5 to 6, 7 to 8 and 9 to 10, and run every Saturday morning. This is a fantastic opportunity for children to participate in football. The children are coached in a relaxed environment, where the focus is on fun and developing the child as a whole. Your child will be supervised from FA qualified/ in training and DBS screened coaches. This is an introduction to football, which allows players to learn and progress each week, ensuring the children benefit physically, socially and psychologically. Underpinning their football development are essential life skills such as, respect, team work, confidence and self-belief. Nirvana Development Academy is a fantastic way for children, who show the potential, to start their journey in playing team football. WHEN: Saturday morning: 9.00am – 10.00am. WHERE: Nirvana Park (Hamilton Park), 100 Sandhills Avenue, Hamilton, Leicester LE5 1LU (Over the winter the sessions move to an inside location at Gateway College). If you would like to be involved, simply come along and join in. 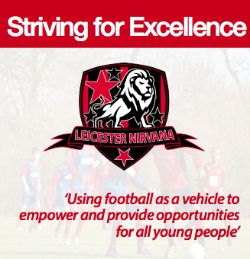 For more information email leicesternirvana@hotmail.com or come along and join us at Leicester Nirvana, Hamilton Park, Sandhills Avenue on Saturday mornings at 9.00am and talk to one of our team. We are always looking for new talented players to join our successful teams. Due to this success and the quality of players at the club, we recruit new players on a trial basis. Players are asked to train with a team for three to four weeks to assess there ability and attitude toward the game and their teammates. At the end of the trial period, the coals or manager will make a decision about the player joining the club. If you would like try out for Nirvana, come and speak to us on a Saturday morning at Hamilton Park, Sandhills Avenue and we will point you in the right direction.